If you're looking for the convenience of disposable products without the environmental impact of plastic or foam, look no further than the EcoChoice biodegradable, compostable sugarcane / bagasse 6" plate! Perfect for both hot and cold foods, this plate is an ideal solution for restaurants, caterers, and sandwich shops that serve anything from hot entrees to cold salads and dessert dishes. Serve up lunch or dinner plates, sandwiches, desserts, and more on this 6" plate. With a bright white finish, this plate will fit almost any restaurant's decor and theme and creates a clean and fresh canvas for any type of food. Plus, this sugarcane / bagasse item takes up less storage space than other disposable alternatives, and it can hold heavier foods than either paper or Styrofoam. We purchased these plates for our June wedding. They looked nice, were a thick quality, and were the perfect size for our donuts and cake. A great value! These plates are wonderful. They are sturdy and elegant with an organic feel. They are perfect to use for company-hosted cocktail parties and my own personal events as well. A win-win...love that durability and elegance of these plates as well as the fact that they are biodegradable. Perfect size for appetizer and dessert buffets. Nice little environmentally friendly disposable plate here! Yet still economically priced. This is a handy sized dish for desserts, side dishes, fruit, etc. It's sturdy and attractive as well! Great product very durable. Perfect size for pastries. A great price point. The list goes on and on. Look no further for the perfect plate. These plates are ideal at being to make sure that customers are able to eat their food, whether it's hot or cold. It can hold up to runny foods too! Good, sturdy plates. We use these in our coffee shop for dine-in pastries, cake slices, brownies, bagels, etc. Much stronger and classier looking than the thin, fluted-edge paper plates. Love that they're better for the environment, too. These plates work fine with a meal that's served right away, but I've noticed that the plates will weaken and become flimsy if they hold food for several hours (eg, if you transported food home in one of these plates and then tried to eat it several hours later). This isn't a problem in our case, however. I love these compostable plates! They are a great thickness, and seem much higher quality than the cheap glossy-coated plates you sometimes see. These are great for casual events. They are super affordable not so expensive compared to the really cheap looking ones. Being biodegradable is just a plus but a great product regardless. These plates are a perfect size for desserts at our buffet style staff lunches. Large enough to allow for a couple of dessert items but not too large to make it hard to carry with their lunch plates. This 6" Plate fares very well for everyday use and it holds up for moist food without causing a calamity! The EcoChoice Brand is great! A++ item as described. We use these to hand out to guests who need a plate for their crazy milkshake toppings such as slices of cake, brownies, cookies. Love that they are biodegradable (beach friendly). These are the perfect size and perfect quality for any wedding. The guests were pleased with the quality and I couldn't have been more pleased with the price. I would purchase these again. We used them for all types of desserts, cake, fruit, gelatin, etc. They held as much as you put in them really nicely. No one complained. Perfect for events! They are durable and compostable. These plates don't sag or fall apart when using them. Perfect size for serving dessert or multiple desserts on one plate. These plates were purchased for use at a wedding during the appetizer and dessert courses. The material was simple, sturdy, and formal enough for a rustic type of event. These plates were fairly sturdy. They worked great as dessert plates for catering event, but would recommend a thicker plate if needed for heavy food. Overall, satisfied with the purchase and would buy these again to use for dessert plates at another event. This plate is the perfect size for desserts. We use it for our ice cream desserts. It is the cheapest biodegradable plate that I could find. These have become my favorite plates for events. They are nice looking, classy, work with many different parties. Best of all though they are durable, heavy weight and work well for wet or dry foods. Highly recommend. We use these bidegradable dessert plates routinely for catering and they're a good price for a disposable. Besides that, they're better for the economy. 1000 Come in a case. 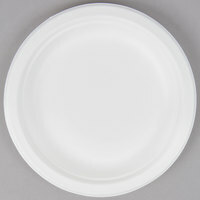 A very nice six inch plate that is biodegradable making it great for the environment. The plates are the perfect size for slices of wedding cake. I used these for the dessert portion of a large BBQ i hosted. They were the perfect size and I liked the thickness - not too thick/thin. I try to be environmentally conscious when using paper and these were exactly what I was looking for. These are awesome! Exactly as described, and perfect for the event we ordered them for. Prompt shipping and great product. Packed well too- boxes are just right for the plates- which also makes for easy storage until we use them. Highly recommend! Great eco-friendly plates, used for desserts at a huge family reunion. I love their earth friendly properties and that they shipped so quickly. Thank you!! I like these plates sturdy and flimsy, really piled the stuff to see how well they held up and they were fantastic. For sure will buy more of these. I'm actually really surprised at how sturdy these are. I bought extra so that we could double-up, since most compostable plates aren't usually that strong...but no need! We use them for every party we have, now. It's so nice to be able to just throw the whole plate with food scraps straight into our compost bin...super easy clean up with no scraping or separating required (winner!)! The size is perfect for desserts and appetizers, but I might go up to a 9" or 10" for entrees. I don't like using disposable products, but I love that these are biodegradable. My customer's love that they are eco- friendly. They are also very cute. These sugarcane plates are perfect for receptions, parties, or home use. These are perfect size for appetizers or snacks. Sturdy, moisture resistant and eco-friendly all in one great product! I have purchased several products EcoChoice Biodegradable and I will Continue. They hold up well with variety of foods. Plus you get a lot for your money and the color works great for any occasion. sugarcane plates are a nice alternative to paper or foam plates. Sturdy plates are perfect for parties, receptions or restaurant use. Small pack of 125 is a nice way to test before you buy a full case. These plates are pretty decent little guys. We love that we can do our part even a little to reduce landfill waste. if you compost these are for you. Decent little plates for the cost. We use them for small pastries, cookies and cupcakes. Sturdy enough for most uses. Will continue to purchase these. We love biodegradable products. this Eco Choice Sugar cane plate was great for buffets and large groups. Good weight. Smooth top with a textured bottom made it great for handling. Perfect size plate for my dessert shop. All individual slices fit well and they hold heavier items (like cheesecake) without folding from the weight! I will buy these again. I purchased these specifically for desserts. They are very sturdy and are easy to pick up from a stack, which is important in order to keep costs down. Cheaper plates stick together which results in additional costs in the long run. We use these for pastries and they work perfectly. Would not recommend for heavier food like burgers, ribs, or anything too saucy. You get a lot for the price and it is great to have an eco friendly option for a product that often gets thrown away within minutes of use. Good price for a biodegradable/compostable product. I use them for slices of pie and they're just the right size for desserts! Will definitely buy again. We use these for individual pastries at our bakery and they look great. They are small enough to fit on the tables (which are only 2' in diameter) and still hold a pastry. Great versatile plates! We used them for a party of 300. As small sand which appetizer plates they were useful without producing much waste. It quickly doubled as dessert plates afterwards! This plates are very sturdy, compostable and just do the job it's supposed to. The pricing here is very competitive. I've used another brand before but the usable area on that plate is smaller than this one. Would definitely recommend it. These plates are awesome for serving desserts or a small side of salad. The plates are strong and can hold a lot of weight with no problems. Excellent product! Very sturdy and green product, and pleasant color for serving food while still keeping costs reasonable. Would recommend this product to anyone interested. Great plates and they are able to be composted, which is important to me. A nice dessert plate or side dish plate, but not big enough for a meal. I like these plates and would recommend. As with most disposable plates, when they get wet and are left for a long time they get mushy, but thats par for the course with disposable plates. Bought these to match other products bought for a baby shower. We used these for our desserts. Doesn't have the plasticky look, or feel. And went great with our theme. I needed a plate that can hold some food that has been dipped into a chocolate fountain which means I need something sturdy and oil resistance. These plates pass with flying colors. We like the quality and durability of these plates. Good value for the money and if you're thinking green, these are for you! 2 thumbs up! We are very satisfied with these plates. We needed something that was microwaveable and these hold up well. Also love that they are biodegradable and a great price. I'm a class mom and I bought these plates for a cupcake party. These are the perfect size for small bites. Also for arts and crafts. I was not sure about the plates but still purchased it because I trust webrestaurant and we are planning to use more eco friendly items. the plates were strong and the best thing is that you can reheat the food with them. I like to use these for sampling. They are a good price for the item and I also like that they are compostable and made from a sugar cane by product. Very sturdy and hold up well. Love these plates! They are good for the environment, which is a positive in itself, but also very sturdy and not so big that they become overly cumbersome. A perfect size for functioning as sample plates for the food we make in class. We use these small plates for individual bakery items. They are the perfect size for a slice of cake or pie. They are somewhat sturdy and hold up well. Superior quality, great value and aesthetically pleasing. These dessert plates were bought for a wedding and their durability was very much the basis on which we bought them and we were not disappointed. These plates work great for us. They are the perfect size for bagel or bagel sandwich orders. I also really like the fact that they are biodegradable. Great product all around. These are great! They came in at a slightly lower price point than the other brand, but are at least as durable and attractive. A great choice for avoiding paper (flimsy, cheap looking) or environmentally-nasty foam. These are a great standard plate, works super for luncheons, banquets, etc. Nice sturdy plate, we recently used for a steak fry and they worked great!